Ribs and other barbecued meats tend to reheat well and only require a few minutes to heat to an edible temperature. 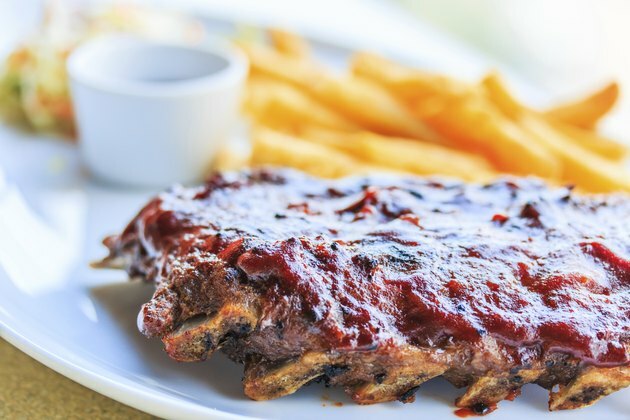 You can cook pre-cooked ribs in several ways, but oven or microwave heating are the quickest and easiest ways to reheat the meat. The microwave is good for small quantities of meat, such as a single serving. The oven works well for both large and small quantities. Put the ribs on a sheet of foil large enough to completely wrap the meat. If you have a large slab of ribs, cut it into smaller sections with a knife. Brush barbecue sauce onto the ribs, if desired. The sauce will carmelize on the ribs. Wrap the foil around the ribs. Put them on a cookie sheet and bake in the oven for 15 minutes. Open the packet and let the ribs continue reheating for another 5 minutes. Remove the ribs from the oven and transfer them to a serving dish. Put the ribs on a microwave-safe plate. Cover the ribs with a plastic spatter guard or with paper towels to protect the interior of the microwave. Heat the ribs on high for 5 minutes and check the temperature of the ribs. If the ribs are hot enough, transfer them to a serving plate and cover them with barbecue sauce, if desired. Continue heating the ribs in 2-minute increments if they aren't hot enough. Transfer and sauce the ribs when they reach the desired temperature.